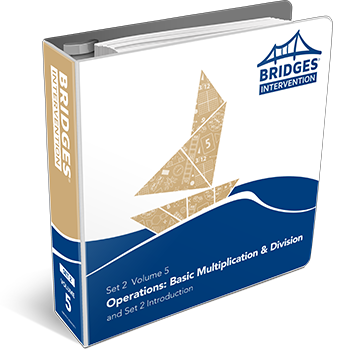 Bridges Intervention offers supplemental, targeted small-group instruction matched to student needs. Students work with models that spur thinking and engagement—starting with manipulatives, moving to two-dimensional representations, and then progressing to mental images. Organized by content rather than grade level, Volumes 1–4 address critical numeracy and computation skills at levels generally associated with kindergarten through second grade, while Volumes 5–9 do so for third through fifth grade. Learn more about Bridges Intervention.